Two British shipping cities, which played a pivotal role in the short-lived existence of the Titanic more than a century ago, have scooped port awards, according to travel website Cruise Critic. 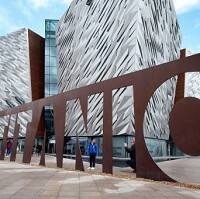 The Titanic's hometown of Belfast has been crowned as the best British port of call after the website claimed the Northern Irish capital had "regained its former glory", while the report added that the "Titanic Belfast Centre has arguably done for Belfast what the Guggenheim did for Bilbao. The fact that more and more cruise ships are choosing Belfast as a port of call, seals its number one spot this year". Southampton, where the majority of passengers boarded the ill-fated cruise liner before cruise travel insurance was conceived, has been named as the best departure port in the UK. "We acknowledge the approach to Southampton is not as iconic as that of New York, but this year, the port excelled in two stand-out events - Cunard's Three Queens (the meeting of the Queen Victoria, the Queen Mary 2 and the Queen Elizabeth) and P&O's Grand Event, showing it can handle a large number of ships with ease."